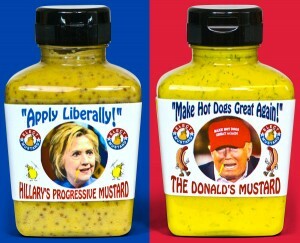 We have created two mustards -– a Hillary Clinton Mustard (“Apply Liberally”) and a Donald Trump Mustard (“Make Hot Dogs Great Again!”). You buy the mustard that matches your preferred candidate and we will report the results. This totally scientific poll will be the best predictor of the November election. Can you vote more than once? That is, can you inflate the results by buying more than one mustard? That would suggest that money can buy an election. Shameful! And very legal. The 2010 Supreme Court decision in the Condiments United case makes it perfectly clear that mustard lovers can buy as many Donald mustards or Hillary mustards as they wish. Vote for Hillary by ordering HILLARY or for Donald by ordering DONALD. We will update the results regularly.